The scariest part of the trip was driving down in the rain to the Setermoen area, 2.5 hours south of Tromso, when Tina and I could not keep our eyes on the road, but rather were looking up at the massive climbs all around us. We were like two kids in a candy store. We were both mesmerized and worried we wouldn’t have enough time to climb everything! 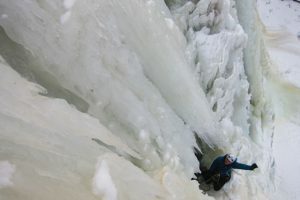 A few weeks back, Adam, my husband, had decided to fly to New Hampshire to attend the Mount Washington Valley Ice Festival, and to visit his family. This was Olivia’s last chance to fly for free before she would turned 2 (already?!?!?!?! ).This meant that I would have two weeks fully to myself! 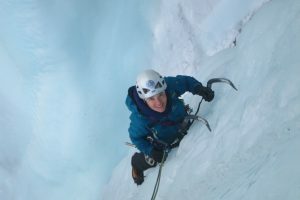 I initially thought I might stay in the Alps to ski and ice climb as much as possible. But the temperatures in the Alps had been unseasonably warm and the ice had turned into a rare commodity. 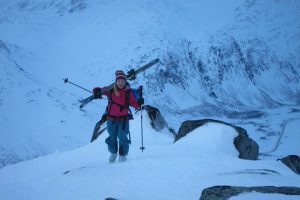 My friend Tina – whom I had climbed Beyond Good and Evil with and who is also mother to a little girl – had the same amount of time off as me and was keen to travel in search of ice. We first considered Canada. I have climbed a lot there and have been there on 4 separate occasion. I thought this could make planning easier since this trip was so last minute. But the forecast was for an all-time low in Canmore with highs of -20 to -30C. We typed Tromso on yr.no, the best weather forecasting sight for Norway, and things looked way more appealing there: the temperatures were around zero that week and we knew it had been really cold up until then in that area. There was bound to be ice there, though finding information on conditions proved challenging. We decided to go and find out for ourselves. I flew in a day early to get all the shopping done before Tina arrived, so that we could head out as soon as she arrived. She flew later in a day, and I decided to go ski touring to make the most of my time there. My new friend Johanna, a local skier and alpinist who had helped us tremendously in organizing this trip, was keen to show me around. 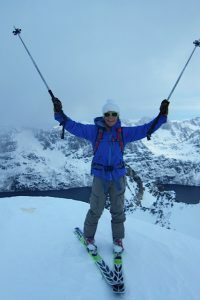 My only criteria for a tour was that I wanted to see the fjords when we reached the summit. So Johanna picked the perfect summit for that. We skinned up to the summit of “Storsteinnestind” (The big rocky mountain in English) on Kvaløya. It is one of the highest peaks on the island (1017m) and it is completely surrounded by fjords. This was a dream come true for me, despite the marginal snow we encountered on the descent. 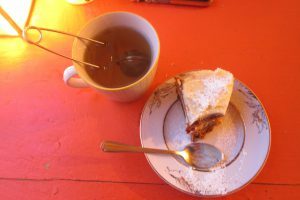 We ended the day by drinking a nice cup of tea in a really cute coffee shop that sits directly on the waterfront, with a nice view on the summit we had just skied. After picking up Tina, we drove straight down to the Setermoen area, where most of the ice we wanted to climb would hopefully be. The first day there, we woke up to rain. This was ourfirst time going on a trip together, so neither of us really dared speak up. But eventually, we did and decided that scoping out the area was a better use of the day than climbing in the rain, getting all the gear soaked and possibly catching a cold on day 1. We pulled out the map and headed to the valleys where we had heard there might be ice. And boy was there ice. Everywhere we looked, we saw lines that would be considered gems in the Alps. Five days of climbing suddenly didn’t feel like enough time! 5-6pitch WI4+ climb that really looked 3 pitches long. But we soon realized that climbs are extremely foreshortened in Norway! Everything is bigger and longer than what it seems. We reached the base of the climb only to realize that it was spurting with water. 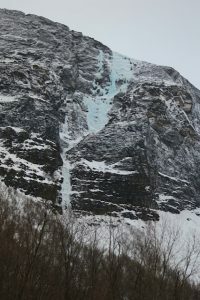 But I wasn’t too upset as I was excited to climb Søylefossen, a beautiful 4 pitch WI5 route just right of Henrikafossen. 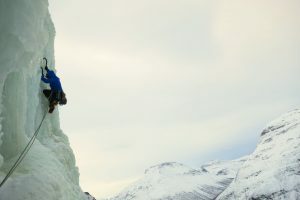 This route was a perfect introduction to ice climbingin northern Norway! for moving efficiently on that kind of ice. We had to swing for our lives and kick hard to be able to get a good stance on the ice. After those two 60m pitches of WI5, it was 1.30pm and the sun was already dimming on the horizon. Usually, when the light starts dimming, night ensues soon thereafter. And psychologically, it is always a little eerie to know that you are going to go into darkness while on a climb you don’t know. Though it doesn’t really make a difference, we were mentally not prepared to climb the crux with the night quickly approaching. It looked really steep, hard and brittle. I felt there was little chance of us making it to the top that day. 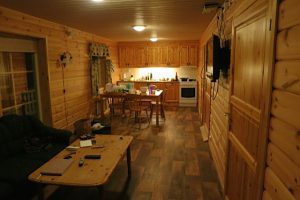 returned to our little wooden red cabin in the woods and enjoyed a good night of rest after what had felt like a long day. The next day, we decided to get on the climb we had dubbed “our rest day climb”: Fleggetbekken (WI 5-6, I think 6 that day, 200m). This is a shorter (looked like one pitch but was really 3 and half pitches long) stunning yellowish line above Flegget lake with a 15min flat approach. We slept in and had a late start. 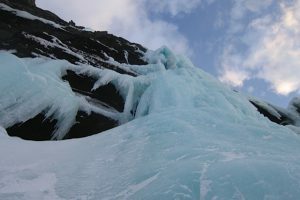 I delicately swung into the base of it and traversed right to reach better ice that required climbing an overhanging mushroom, but at least, it was solid ice! I reached a cave after 30m of climbing and decided to stop there. That pitch had kept me on my toes the whole way and I needed a little mental break. 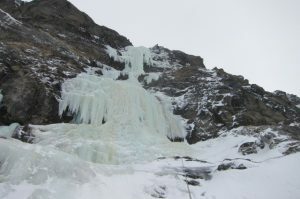 The following pitch was super steep still but the ice was better though brittle. I climbed up a little groove that turned into a wide wall of perfect ice all the way to a cave. 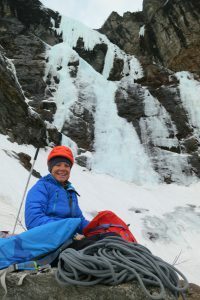 Tina led on and climbed a long pitch of perfect yellow ice. 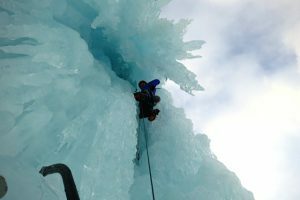 We topped out after climbing the forth pitch, a 60m rope stretcher of hero ice to the top. I was surprised that there was no fixed gear in place.In the Alps, there would have been slings around a tree from the previous year to rap down, but not in Norway. The ethic there is not to leave any gear in place, and not to bolt routes or anchors. So, to comply with these rules, we threaded the rope directly through the V-threads we drilled and rapped down that way. This system doesn’t leave any gear in place and is very efficient. Why did we ever use cordelettes before? It was getting dark when Tina joined me on the summit. We turned our headlamps on and after a quick summit shot, we rappelled down to the packs. This “rest day” climb proved all but restful and actually, we opted to rest the following day! 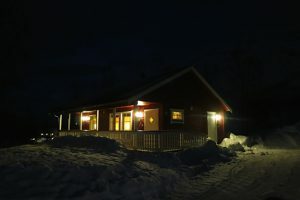 Knowing that, we stayed up late in hope of seeing some northern lights in the sky. We drove around in the dark and eventually saw a little glimmer of green light spurting up into the sky… it was surely better than nothing! t on. Though I had initially thought that this was just one of the climbs here, somehow, I couldn’t brush it off my mind, and neither could Tina. Was it because we had failed on it? or because it was such a cool and big looking line that some people had taken up to 2 days to climb? Ultimately, I think it had to do with the fact that this looked like a dream line. Tina’s eyes sparkled. The big grin on her face made me realize that she had been thinking the same thing. We drove back to the cabin to dry our gear and rest up for the big day. At 2.30, I was up. 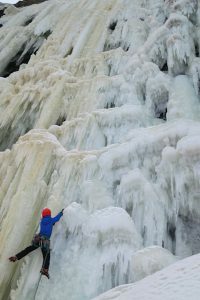 As often when ice climbing a lot, I get carpal tunnel syndrome and the numbness in my fingers woke me up. I made the mistake of looking at my watch. I could have slept for another hour, but the tingling made it hard to fall back asleep. So I woke up, got the gear ready and put my bags in the car. This was our last day there, so we were all packed up to head back to Tromso that night. We headed out around 4.30am, driving the hour long drive to the climb at the end of the Sordalen valley. It was pitch dark and we wondered if we would be able to find our tracks in the snow to see where to go. We reached the bottom of the climb by 6.30am. 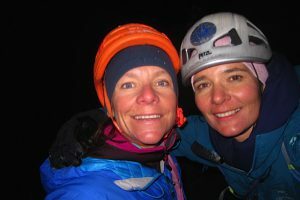 It was still dark and Tina climbed the first three pitches in one push, with me following behind. 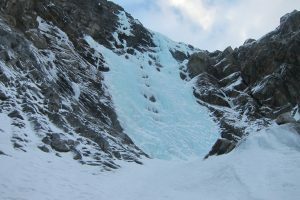 I led on up the ice and snow section to the base of the headwall. It started snowing sideways and I wondered if that would end our climb. But why would it? Was this a way of thinking to psyche myself out of climbing this route? We reached the high point where we had come down from a few days earlier. The next section was steep and intimidating. The sky had cleared now and we had plenty of time to climb it, so the odds were in our favor. Tina led up to a cave at the base of the main curtain. From where I was belaying her, it seemed like the next section would not be so bad. I was actually excited to climb it. 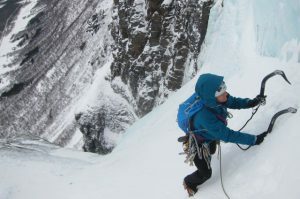 But when I reached her belay stance, what lay ahead looked terrifying: huge daggers were dangling everywhere, everything seemed brittle and hollow. I wondered how safe it was to climb this. 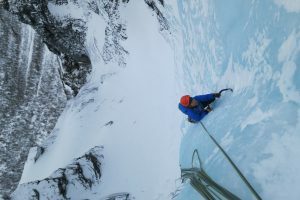 I sat down, laced up my boots up a bit, took the rest of the gear from Tina, took my puffy jacket off, grabbed my tools and made the first move up the pillar. I was focused. Tina was very supportive: some people really bring out the best in you and Tina is just that person. 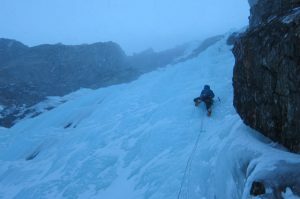 I stemmed my feet and chimneyed inside the belly of the beast for a few meters where the ice was better and would take better gear. 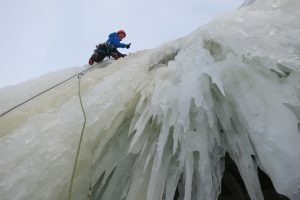 I had to be careful not to clean too much ice as Tina was right below me and I didn’t want to hurt her. When I reached the top of the overhanging section I was climbing under, I had to traverse right onto the main wall. The ice there was really brittle and hollow and it was hard to get good sticks. Eventually, I hooked a flat ledge. With both my tools. Instantly, I knew. This was a fracture in the curtain I was standing on. I took my foot off the dagger. But the whole wall I was on was also fractured. It was a big 20-30cm large gap that ran all the way to the back of the wall. I wondered what the dagger was holding on to. I considered coming down but Tina said: “The main wall looks solid”. These words motivated me to go up and somehow, fear didn’t overcome me. I had the gut feeling that all would be ok. The safest option now was to keep going as fast as possible and get Tina above the crack. I built a super solid anchor, pulled the rope and Tina came up. I was relieved when she told me she was above the crack. And so was she! Tina led up the steep following pitch. We were loosing the light pretty quickly now and was excited to reach the top and start down before it was dark, to make sure we found solid ice for the V-threads. 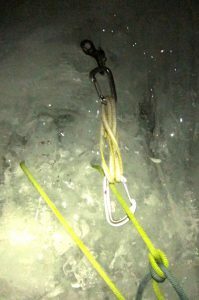 A lot of the ice on the pillar hadn’t been that great, so it was important to have a good idea of the quality of the ice before rapping off this single point anchor. One person would go down, and start building the anchor while the other one descended. We would thread the rope through the V-Thread and go down to the next rappel. We got really efficient at this process with the amount of V-threads we had to build on this trip. Night caught us when we were half way down the headwall. 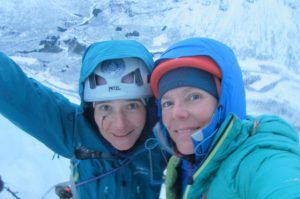 And 9 rappels and 60m of down climbing later, we were safely back on the ground, away from the hazards of the headwall, and overwhelmingly content with this last day of climbing Norway. It seemed like all the climbs that week had gotten us prepared for this last big day! As we drove back in the night to Tromso, I had to pinch myself to make sure I hadn’t just dreamt up this whole week of climbing. And I was already looking forward to the net time I would be looking out the car window instead of at the road, eyes riveted to the magical lines all around me that I would want to climb!